oh facebook. i have a love-hate relationship with this master of social media. i love so many things about it. i love the connections i have made with friends throughout my life. i love hearing about the major milestones in people’s lives. i love seeing my friends’ children grow up before my eyes. i love knowing when people are struggling and how i can help. i love the wonderfully social aspect of it all. 1) stop posting political rants. we get it. you have an opinion. you have your chosen candidate. you love them. you can’t stand the other person. i have my own political candidate that i will be voting for. that information is, frankly, none of anyone’s else's business. if you have something political that you think is vital to share, i get that. if you have something you are incredibly passionate about, i get that too. please stop, however, the constant barrage of political posts that have the sole purpose of bashing one of the candidates and basically stating that anyone who votes for that person is an idiot. that is what i’ve seen more than anything else where political posts are concerned. one candidate or the other is an absolute disgrace and everyone who stands with them is blind, or idiotic, or racist, or criminals, or you name it. i’m willing to bet that very few people’s political opinions were changed because they read someone’s facebook post. a political race by definition means that we are going to disagree with the politics and ideals of a huge amount of the population. can’t we just agree to disagree without calling each other names? am i alone in this? i can’t be the only one who is tired of the onslaught. just stop, people, for the love. 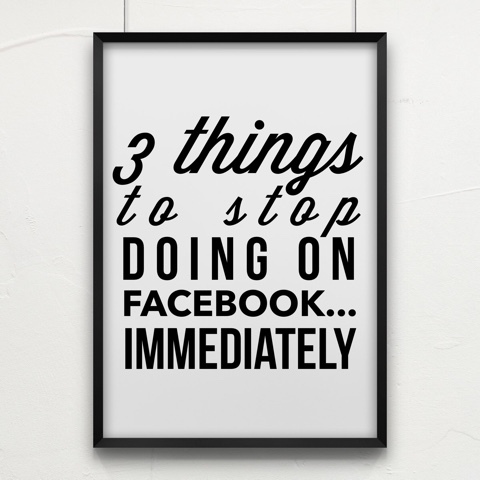 2) stop posting anything that publicly shames someone else. this one pushes me over the edge. i’ve seen grown women publicly shaming a child on facebook. i’ve seen neighbors publicly shaming the yards of other neighbors. i’ve seen countless examples of people jumping onto the story of a horrible tragedy and saying horrific and barbaric things about someone’s parenting. how many people told the poor, grieving parents whose child was taken by a crocodile at disney world that they are horrible parents, that they didn’t deserve their children, that they should be sterilized? i sat appalled at some of the comments i read and was absolutely nauseated at what people said to others, all behind the safety and anonymity of their computer screens. these are real people we are speaking to. slander is never a good idea…and it says way more about the person who writes it than it does about the person it is written to. do yourself and everyone else a favor. if you have something to say to someone, do it in person. if you cannot talk to that person face to face, keep your comments to yourself. trust me, this will benefit everyone. we have become the nation of the easily offended. we get offended for ourselves. we get offended for others. we walk around looking for ways someone has wronged us. we get upset at people all the time, for every reason under the sun and, whether we post about it or not, we read things posted on facebook and let it affect us. i’m talking to myself on this one too. how often do we read something we don’t agree with and we can feel our blood pressure rising? how often do we read the political posts and get upset? how often do we read through the angry posts of others and get indignant or angry? how often do we let what people write in a post affect our emotions. i know i’m guilty of this. when that happens, close the computer screen and walk away. it’s not worth it. you can respond to the hurtful comment of someone with another hurtful comment of your own. you can combat that political opinion of someone with an equally offensive post of your own. or you can close facebook and walk away. i’m guessing no one will change their minds or their behavior because of what we write on any given post. more than anything, we perpetuate more hate and anger when we answer combatively. how about instead of getting offended and entering into a heated online debate, we make someone a meal, or ask someone to meet us for coffee, or invest in another person in even the simplest of ways? energy is a limited commodity. let’s invest it into things that are worthwhile and not into being so easily offended. that's it. it's not a long list but it covers so many things. wouldn't facebook be wonderful without it all? i think it would. let’s get back to posting things about our lives. post me your struggles and i’ll be happy to walk with you through them. post your victories and your joys, i want to share those with you. post moments in your life that make you laugh or make you cry….i want to join in that with you as well. i love the things on facebook that bring us all closer together. that is what makes it so magical. keep the good things coming, friends. that stuff brings me joy and connects us all together and, frankly, we could all use more of that.